Cool Airplane Nursery Theme Ideas, Decor and Bedding to Help You Create a Wonderland Baby Nursery in the Sky for Your Little One! Airplanes make a fun and exciting nursery theme that will last your little one right through the toddler years. Whether you choose to use vintage classics or cartoon airplanes there are lots of different ways to spin this nursery idea. You'll also find a world of inspiration in the wide range of airplane baby room decor available on the market. From flying chandeliers to airplane rugs, you'll find everything you need to decorate your airplane nursery at our Airplane Nursery Decor Store. Or visit the airplane theme section at ababy.com. You'll find a gorgeous selection of mix and match airplane theme decor all in one place. Furniture, bedding, lighting, rugs and more. 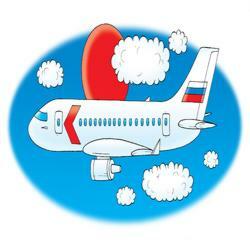 It's your one stop airplane theme shop! Click here to go to the ababy.com airplane theme section. 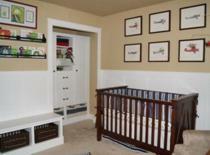 If you are decorating an airplane theme nursery enter it in our baby nursery photos contest here. You could win a great prize and we will add your nursery to this page to inspire other moms! 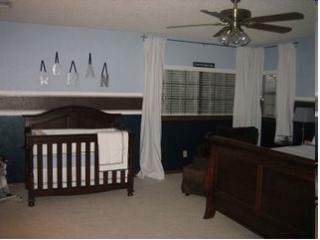 Blue, white and grey for a vintage nursery. Red, white and blue will work for a bi-plane or a cartoon airplane theme. 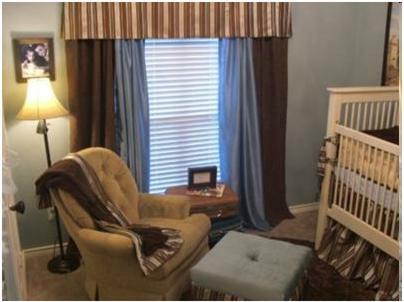 Green, white and blue will result in a softer baby nursery design. 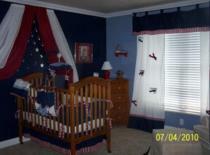 Try red, white and a touch of black for a more modern nursery approach. If you decide on a vintage airplane theme, vintage airplane posters in silver frames make stunning nursery wall art. If you want to go for a cartoon type airplane theme, try painting or sticking a big airplane on the main nursery wall. Paint puffs of smoke coming out the back of the plane all the way across the wall. Paint your baby's name in the smoke - one letter in each puff. 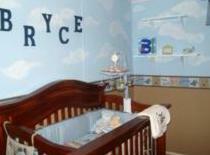 You could also paint or stick clouds across the wall and paint your baby's name in the clouds instead. Paint or stick a few small airplanes diving in and out of the clouds. Or how about painting a banner behind the airplane with your baby's name on it. If you decide to mix hot air balloons with your airplanes, these could also be dotted across the wall with your baby's name letters painted in them. Another idea is to find a couple of model airplanes and hang them from the ceiling so that they look as though they're flying or add airplane wall stickers to your ceiling fan. Add a few children's storybooks with an airplane theme to your baby's bookshelf. You can talk to him about the pictures in his room and on his bedding as you go through the stories with him at bedtime. 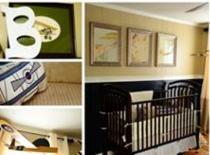 An airplane theme nursery can be really fun if you mix it with a Winnie the Pooh nursery or baby Disney nursery theme. Paint your favorite characters sailing through the sky in their flying machines or sitting on the ground gazing up at the acrobatics going on above their heads.